Over the course of my apprenticeship I’ve worked on countless men’s garments of all shapes and sizes. The way we approach each garment varies depending on the cloth, size, shape and style. Also in that time I’ve worked on a very small portion of women’s jackets including one of mine that I made last year. These were essentially a ‘shrunken’ version of the men’s style and relatively straight forward. During the summer I began to consider the differences in men and women’s build and shapes. I thought it would be a really interesting project to explore this further and I was dying to make more jackets for myself anyway! I discussed this with Jennie and she said it would be very beneficial to make something for my self. 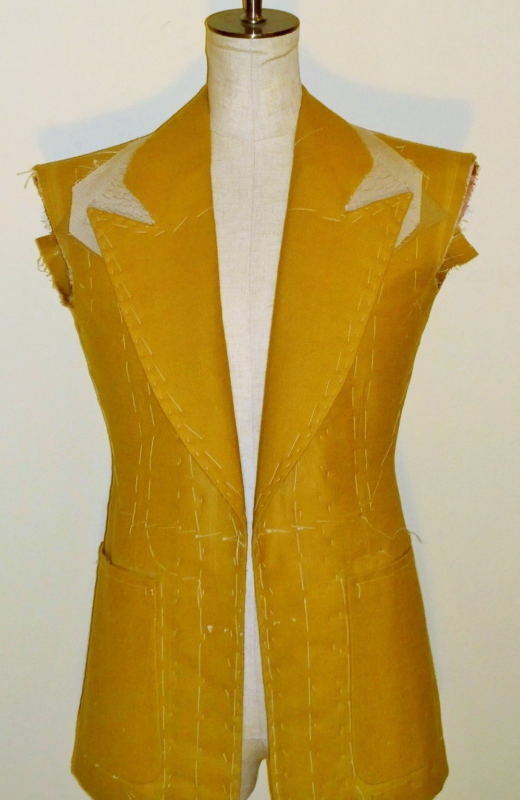 With this in mind I approached Leslie Haynes and he very graciously agreed to help me by measuring, cutting and fitting the garment. He explained the idiosyncrasies of a woman’s figure and its been really fascinating going through the fitting process. I spent several hours trying to decide what cloth to go for with the help of William and Martin eventually settling on this gorgeous one from W.Bill. It’s part of the golden bale bunch and I think its really achieved the 60s/70s style vibe I was going for. Our Trimmer, Michael Bisson helped me chose the fabulous pink lining! 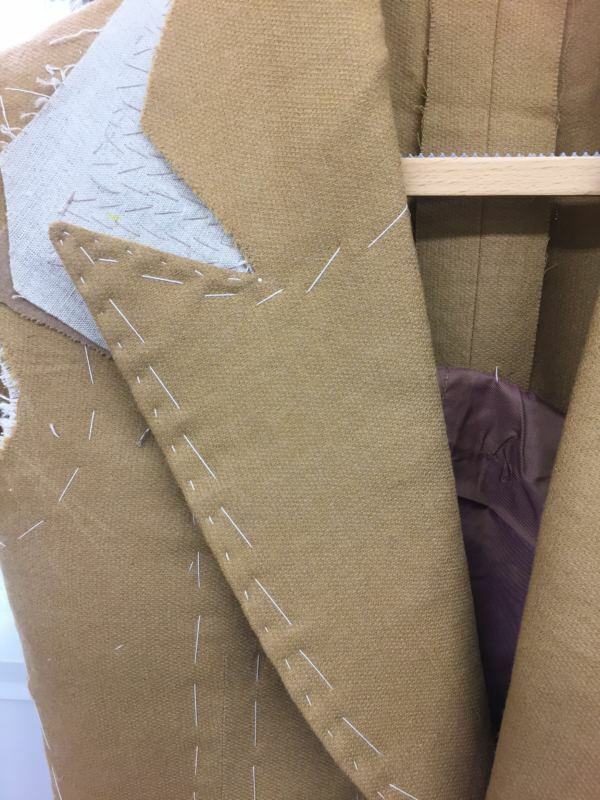 There is a lot more shaping involved with women’s garments therefore you have to alter the way you canvas, shape and press it. I’m currently putting on the under collar, prior to this I had to close the shoulders. This was a really important stage as you have to be really accurate with the distribution of fullness and ensure its equal. 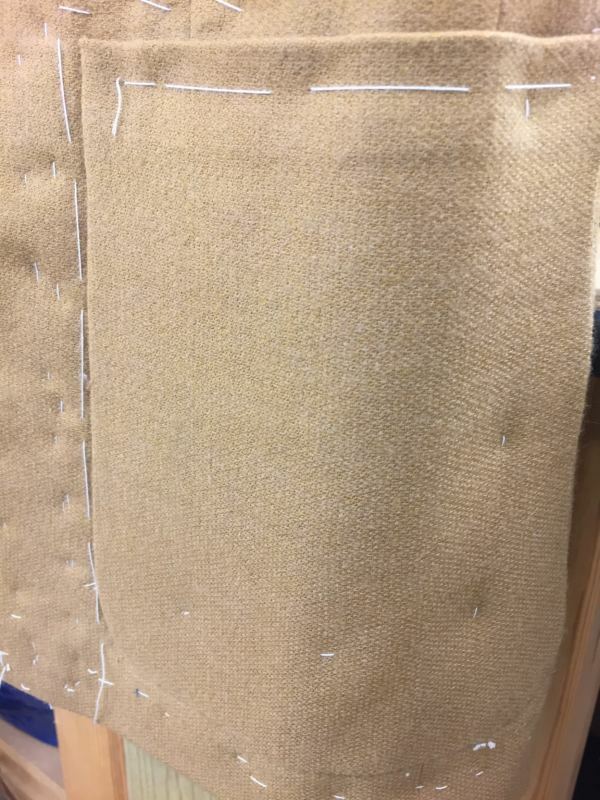 This applies to the collar as you don’t want too much or too little. You also need to make sure that both sides of the collar are equal. 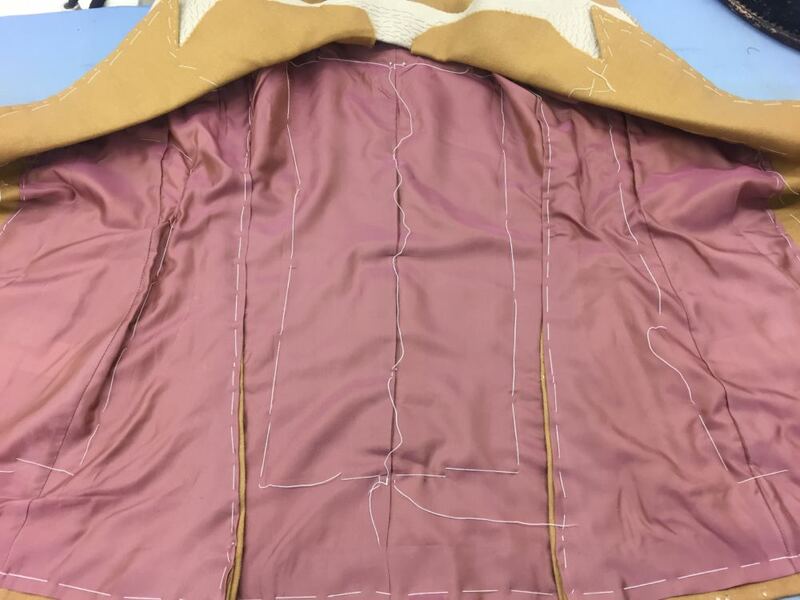 This is particularly important when you are working with a patterned cloth as you don’t want any discrepancies once you put the top collar on. Once I’m happy with the under collar I will then be shaping it and putting the top collar on. I’m really looking forward to getting it finished and seeing the final results! I’ve got two beautiful velvet’s I’m itching to start on so I hope this ends well!